A talking point even before it was open, WAM Architects’ design for a new 160-room hotel proves that even a jobbing business hotel can have a sense of humour. 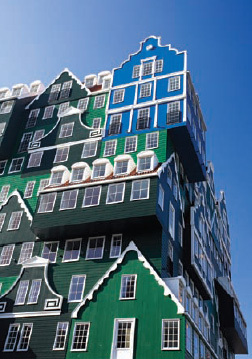 Dutch architecture is noted for its wit and playfulness and WAM Architect’s design for the Inntel Hotel Amsterdam Zaandam in a satellite centre of Amsterdam definitely provides further evidence for this commonly held belief. 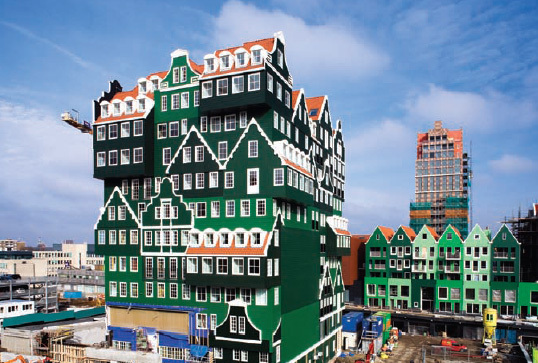 What might have been a more straightforward multi-storey hotel becomes a cleverly interlocking ‘pile’ of traditional Dutch façade forms stacked upon each other. It’s also perhaps rather ironic that WAM have used the most traditional of Dutch architecture vernaculars for this particular building since their previous work has often been noted for introducing hybrid references – such as American prairie bungalows crossed with Swiss chalets- not usually encountered in the Netherlands. This approach is somewhat off the main path of the ongoing Dutch architectural preference for modernist aesthetics and is something that WAM refers to as ‘fusion’ architecture and something that the rest of us probably think of as post-modern. In the case of the recently opened hotel, the project is part of a larger scheme to rejuvenate the rather dull town centre of the sleepy satellite town, once effectively a town in its own right and now more of a de facto suburb of the Amsterdam conurbation. Under the new town planning scheme, the historic street pattern and a waterway will be reintroduced in attempt to bring back some of the local character wiped off the face of the landscape by more brutal modernist approaches to development decades ago. WAM Architects’ Inntel Hotel Amsterdam-Zaandam stands at the centre of this new development, a suitably noticeable talking point for the reinvigorated municipality. Zaandam’s history is an interesting but quiet one. Situated on the Zaan with good routes to the sea, it was once a centre for ship craft. Thus, one of its main claims to fame is that the Russian Czar Peter I spent some time living in Zaandam in 1697 whilst studying shipbuilding; the house is now preserved as a museum. The town’s second main claim to fame is its connection with the painter Claude Monet who spent time capturing the sleepy idyllic atmosphere of the town in the late nineteenth century. It is this second connection that is directly referenced in the design of the hotel. All of the Dutch facades of the ‘houses’ comprising WAM’s new hotel are based on local historical facades and range from the rustic humility of workers’ cottages to the pomp of the historic state notary’s house. Yet in WAM’s amalgamation they are all standardised in a traditional green, save for one, which is blue. ‘The Blue House’ is a direct reference to Monet’s painting completed at Zaandam in 1871. Hardly meant as a chic inner city lair for urbanites, the hotel nonetheless underscores the Dutch approach that simply because hotel accommodation might service a less trendy clientele – for example people visiting on business with the numerous corporate headquarters that have grown up in the district- there is no need for it to be bland. In a kind of cohesion with its façade, the design for the interior combines simple modernist lines and furnishings with accent walls covered with wallpapers made from historic photographs or enlarged details of vintage designs for chocolates and biscuits of the types once produced in local factories. Frankly, for anyone familiar with the general quality – and pricing – of hotel accommodation in Amsterdam’s city centre, it’s also a good option for the canny tourist seeking affordable cotemporary comfort with good public transport connections to the hustle and bustle of central Amsterdam.